COLUMBUS—[excerpt] The nature of design has shifted radically in the last 15 years. As a profession, its members now include animators, sound editors, architects, programers, musicians, and videographers, collaborating in the development of Web sites, video games, kiosks, interactive DVDs, motion graphics, and instructional media. I’ve worked with a variety of experts in the arts, engineering, design, and education, and I find this collaborative process endlessly exciting. I’m eager to meet like-minder people to push the boundaries of content, design and technology. 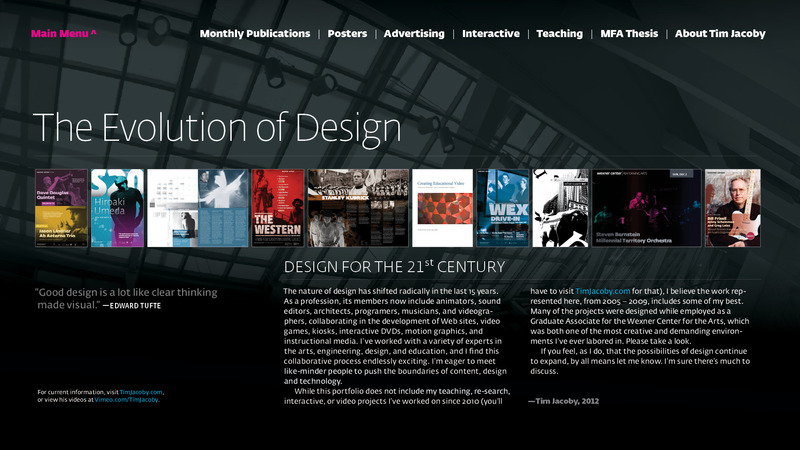 While this interactive portfolio does not include my teaching, research, interactive, or video projects I’ve worked on since 2010, I believe the work represented here, from 2005 – 2009, includes some of my best. Many of the projects were designed while employed as a Graduate Associate for the Wexner Center for the Arts, which was both one of the most creative as well as demanding environments I’ve ever labored in. Please take a look. If you feel, as I do, that the possibilities of design continue to expand, by all means let me know. I’m sure there’s much to discuss. View Tim Jacoby’s Interactive PDF (35.9 MB), or left-click to download.